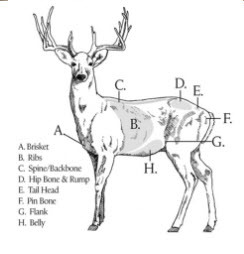 Body condition scoring can be a useful tool to monitor the health and condition of your deer. Maintaining optimal body condition in bucks can help to support great antler growth, does may be more fertile with increased potential to produce more high-quality milk which can result in healthy, fast growing fawns. Scoring should be done on an annual basis. For does, it’s recommended to score mid-to-late summer. If body condition score is poor, this will give time to adjust nutrition to improve body condition scoring prior to breeding season. For bucks, it’s recommended to body condition score in late winter or early spring. If body condition scores are poor, this will give time to make adjustments to nutrition to improve body condition before antler production begins. The Purina Animal Nutrition Body Condition Scoring System allows you to visually score deer based on fat coverage on several key body areas. An ideal Body Condition Scores lies between 3 and 4 and can be as high as 4.5 just prior to the rut, especially in bucks. Deer is emaciated. Majority of ribs are prominent during summer and visible but less distinct in winter. Spine appears sharp with a steep muscle angle and prominent saw tooth appearance form the side. Hip bone is clearly visible with sharp edges, surrounded by sunken muscles at the rump. Tail head is devoid of fat and framed by deep sunken depressions on each side, resulting in sharp looking pin bones. Belly is tucked high with hollow flanks and a sharp shelf. Brisket is thin and narrow. Deer is thin. Many ribs visible but not prominent during summer. In winter, ribs are slightly prominent. Spine is evident but not sharp, with a somewhat steep muscle angle and mild saw tooth side appearance. Hip bone is clearly seen, with sharp edges and slightly sunken rump muscles. Tail head displays sunken depressions on each side, with sharp pin bones and a small amount of observable fat. Deer is strong, muscular and healthy. Ribs should be slightly visible but not sharp during warmer months. Ribs are nicely covered in flesh and not visible in winter. Spine is visible, but not prominent and surrounded by moderately sloping muscles. No “saw toothing” of the spine is visible. Rump clearly visible but not sharp, featuring flat, angular muscles. Tail head reflects slight hollows on either side, rounded pin bones, and a small bit of fat. Belly has a slight depression with slight shelf and lean appearance with no fat rolls. Slightly rounded brisket. Deer is healthy, but carrying a few extra pounds, considered normal and healthy prior to rut. Ribs are not visible. Spine is not readily seen, with adjoining muscles rising at a gentle slope. Hips are full with hip bone barely visible. Slight depression can be seen beside tail head. Pin bones appear rounded and smooth. Flank is full with no shelf. Slight fat rolls developing. Brisket appears full and rounded. Ribs are layered in fat. Spine lies buried in fat, surrounded by rounding muscles with little to no slope. Hip bone is hidden by fat. Rump appears full and overly round. Tail head is covered with rounding at each side, pin bones are buried in fat. Belly is distended, with full flank and no shelf. Fat rolls are clearly evident at the midline and brisket. Does may have reproductive problems. Monitoring deer utilizing the Purina Animal Nutrition Body Condition Scoring System will help track the health of your animals and allow time to adjust before heading into critical periods of nutritional stress. An ideal body condition score can lead to healthier animals with more production potential that can lead to a healthier bottom line. This entry was posted on Thursday, August 18th, 2016 at 7:49 pm	and is filed under News & Updates, Wildlife, Deer. You can follow any responses to this entry through the RSS 2.0 feed. Both comments and pings are currently closed.